Explore what makes IIAD different! 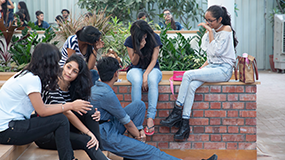 Top reasons why IIAD is a preferred choice among design aspirants. Know more about our partnership with one of the top ranked Design Universities Worldwide. Unleash your creative side. Watch the most awaited event of the year! Explore life beyond academics with a plethora of activities on campus. Design the next mobile app, advertisement, movie poster, website or video-game. The world needs better spaces - design and repurpose urban India. Fashion is not necessarily about labels or brands. Its an application of your imagination and creative skills to make a statement.